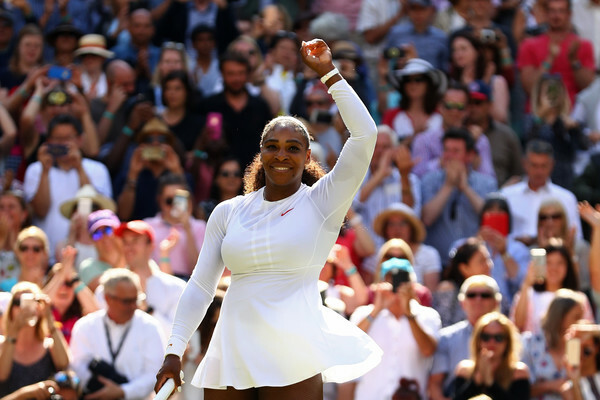 Serena Williams produced another invincible performance to oust a terrific Camila Giorgi, who led by a set but could not sustain her level as the American ultimately triumphed 3-6, 6-3, 6-4 to reach the last four at Wimbledon. 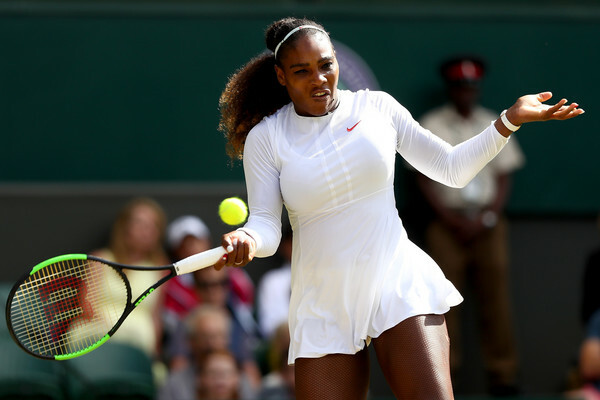 Serena Williams overcame a huge scare as she was able to gather her powerful serves to oust the dangerous and hard-hitting Camila Giorgi in the quarterfinals of the 2018 Wimbledon Championships, triumphing with a 3-6, 6-3, 6-4 scoreline after just an hour and 42-minutes of play. The American was solid on serve and was only broken once throughout the encounter. Moving into the semifinals for the umpteenth time, Williams will now face debutant Julia Goerges there for a place in the final. The 23-time Grand Slam champion, who is looking to match Margaret Court’s record this week, is the favourite to claim the title with her current form and serving statistics. Whereas, it was an incredible week for Giorgi, who reached her maiden last-eight appearance at any of the Majors before putting up a consistent performance throughout the tournament. Giorgi had a nervy start to her first-ever Grand Slam quarterfinal appearance and things got really tight in the opening stages as the Italian served a double-fault to concede the first break point opportunity to Williams. Nonetheless, the cool-as-a-cucumber Italian was able to regain her focus immediately and claim the confidence-boosting service hold despite the early nerves. Williams, a veteran at this stage having reached the last eight for the 13th time in her career, faced no such issues as she held her serve to love to get on board. 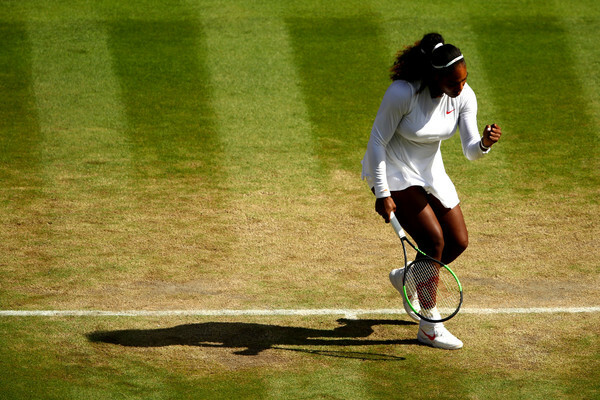 Williams was constantly applying the pressure on the return but faced no problems on her serve, holding her serve to love in all games — with the exception of one which proved the difference in the set. The sixth game was horrendous in the American’s standards as she failed to deal with Giorgi’s pace well enough, allowing the Italian to come out of nowhere to draw the first blood and make the first breakthrough. The 23-time Grand Slam champion, who is still chasing for more history this week, had the golden opportunity to produce an immediate fightback but failed to convert her chances despite having a 0-40 lead on the return. Giorgi’s baseline game was firing on all cylinders with her consistency being exceptionally evident today. She made the incredible escape and consolidated the break for a commanding 5-2 lead in the toughest way possible. Despite Williams’ ease in her service games other than the sixth game, it was Giorgi who was more efficient on the pivotal points and ultimately served out the opening set 6-3 after 35 minutes of play, hitting eight winners to just six unforced errors. Overcoming the disappointment of losing the tight opening set, Williams started the second on a perfect note. However, Giorgi proved that she was just as good; claiming yet another comfortable service hold to stay in touch with the American. However, the first break almost arrived upon us early in the set but Williams was able to fend off two unforced errors and recover from a 0-30 deficit to narrowly hold serve. This disrupted Giorgi’s momentum and confidence as Williams finally claimed her first breakthrough after what seemed like an eternity — firing a powerful forehand winner to grab her first lead after missing out on six break points earlier. She then easily consolidated the break for a formidable 4-1 lead which allowed her to edge closer than ever to the win. A string of routine holds followed for both players as Williams continued to apply the pressure while Giorgi was able to save two set points on the return although the former world number one finally sealed the second set with the exact same scoreline to level the scores and send the match into a decider. A stunning second serve from Giorgi allowed her to escape from a tricky opening service game at the start of the deciding set. However, Williams remained flawless on serve after that early disappointment in the opener, and Giorgi was simply unable to even win a point on the return without the help of a Williams unforced error in the closing stages. Giorgi’s old habits came back to haunt her as a lapse in her focus proved to be extremely costly as it cost her the match. A double-fault started the third game and the Italian’s game went haywire from there, failing to find her first serves and allowing Williams to exploit the vulnerable second serves. Impressively enough, Williams lost just three points on serve in the final set while Giorgi could not find a break point opportunity after the conclusion of the first set. After a string of seven consecutive service holds, it was the American who charged towards the semifinals after yet another successful match, firing 24 winners to just nine unforced errors.